Sunny Nash, author-journalist, earned the highest distinction offered by the 2018 London School of Journalism Media Law Program, the Honors Diploma, for a sound understanding of key legal principles, outstanding ability and expertise. 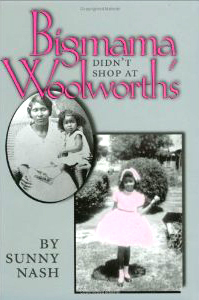 ​​​Author of Bigmama Didn’t Shop At Woolworth’s about life with her part-Comanche grandmother during the Civil Rights Movement, Nash’s book is based on her column of 16 years with the Hearst newspaper, The Houston Chronicle, and the Knight-Ridder newspaper, The Eagle, Nash’s book was selected by the Association of American University Presses as a Book for Understanding U.S. Race Relations and also recommended by Miami-Dade Public Library System for Native American Collections. Robin Fruble of Southern California said, “Every white person in America should read this book (Bigmama Didn’t Shop At Woolworth’s)! Sunny Nash writes the story of her childhood without preaching or ranting but she made me realize for the first time just how much skin color changes how one experiences the world. But, if your skin color is brown, it matters a great deal to a great number of people. I needed to learn that. 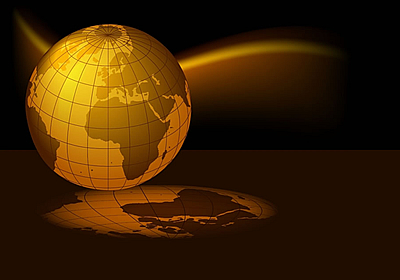 Sunny Nash is a great teacher,” Fruble said. 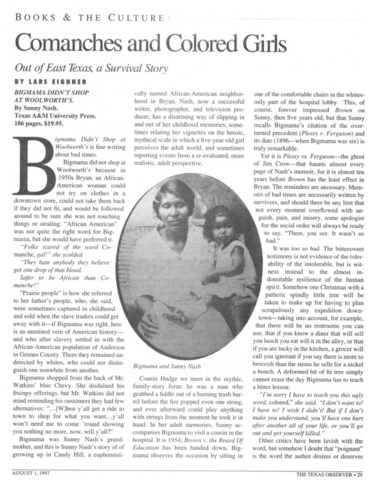 ​​Her book features stories about life with her part-Comanche grandmother, Bigmama, before and during the Civil Rights Movement of the 1960s in the Jim Crow south. Although she wrote the book with emphasis on Bigmama, her mother and father wrestled with Jim Crow racism while giving her the life of a little princess with imagination but without the luxury of having a lot of money. "My family did not waste compliments on me. They reserved accolades to celebrate real accomplishments, not just because I dragged myself out of bed before noon on Saturday or because I made an 'A' on my report card."